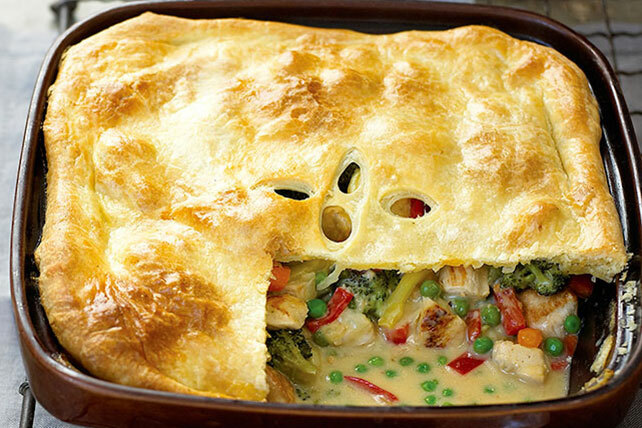 Make a chicken pot pie that's as delicious as Grandma's! Luckily our Gram's Chicken Pot Pie Updated recipe is much easier to put together and just as tasty. Cook and stir chicken in dressing in large skillet on medium heat 5 min. or until done. Stir in vegetables and soup. Spoon into 9-inch square baking dish sprayed with cooking spray; top with VELVEETA. Unfold pastry sheet; place over chicken mixture. Fold under edges of pastry; press onto top of baking dish to seal. Brush with egg. Cut several slits in pastry to permit steam to escape. Place dish on baking sheet. Bake 30 min. or until crust is deep golden brown. Let stand 5 min. before serving. Save 30 calories and 5g of fat, including 3g of sat fat, per serving by preparing with KRAFT Lite Zesty Italian Dressing, fat-free reduced-sodium condensed cream of chicken soup and 2% Milk VELVEETA. Serve with a mixed green salad tossed with apple slices. Remove pastry sheet from freezer; cover with plastic wrap. Thaw at room temperature 30 min., or in refrigerator 4 hours. Thawed wrapped pastry sheets can be stored up to 2 days in refrigerator.